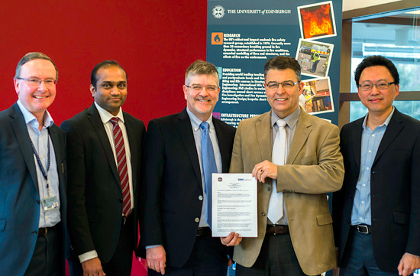 DEM Solutions and the University of Edinburgh formalize strategic relationship to enable greater collaboration and knowledge transfer between the two leaders at the forefront of research, application and adoption of DEM simulation of bulk materials. Strategic partnership creates coveted summer internship positions at DEM Solutions for the University's School of Engineering Master's students. DEM Solutions, the company setting the standard for engineering application of discrete element method (DEM) simulation, and the University of Edinburgh, today announced the formalizing of a strategic relationship to enable greater collaboration and knowledge transfer between the two leaders at the forefront of research, application and adoption of DEM simulation of bulk materials for optimizing engineering design of equipment and processes used across the many manufacturing industry sectors. "DEM Solutions has retained strong ties with the University of Edinburgh's School of Engineering since its formation as a spinout over a decade ago" stated Dr Richard LaRoche, VP Engineering of DEM Solutions. "EDEM® is powered by state-of-the-art DEM modeling technology that originated out of the University of Edinburgh, and DEM Solutions has developed it into the most powerful commercially available DEM simulation software used in industry and by academic and research institutions around the world. The University, and specifically the School of Engineering with the expertise of Professor Jin Ooi, continues to be a key contributor to an active EDEM user community which is instrumental in providing new applications for EDEM and enabling us to continue to meet the needs of our customers with new features and capabilities. Valuable contributions by members of the School of Engineering faculty and students have included material calibration, advanced physics contact models, advanced material modeling and DEM analysis, to name but a few." DEM Solutions and the University of Edinburgh have collaborated on many joint projects over the past 10 years with DEM Solutions providing EDEM software and support, as well as providing internships and industrial placements for the undergraduate students, PhD students and post doctorates. Pan-European and cross-sector collaborations include PARDEM, an EU funded Framework Programme 7 (FP7) Marie Curie Initial Training Network (ITN) project which ran 2009 to 2013 under the project coordination from the University's School of Engineering. Future collaborations will include T-MAPPP (Multiscale Analysis of multi Phase Particulate Processes) which has already confirmed €4.05M approved funding under the FP7 ITN. Professor Jin Ooi of the School of Engineering confirms the many benefits associated with the well established research collaboration with DEM Solutions,"It has been a pleasure working with DEM Solutions from its inception and to develop our research collaboration as the company continues to grow and develop its business. The access to the latest commercial EDEM software has been most beneficial for our research endeavours and at the same time, has provided an effective pathway to impact for our research outcomes. This internship will provide our undergraduate students with an excellent opportunity to work with a hi-tech engineering simulation company, thereby enhancing their training and work experience, and increasing their employability to industry." Dr LaRoche added,"We have a strong EDEM user community which has been and continues to be essential in fueling innovation and extending the application and usability of EDEM in the engineering design and performance verification of equipment that handle or process bulk materials. DEM Solutions and the University of Edinburgh have worked in close collaboration for many years, and our relationship is a testament to what can be achieved when industry and academia support each other to foster innovation. This strategic agreement unpins our ongoing commitment to supporting the success of the School of Engineering, and we are proud to be able to sponsor the summer internships over the next five years and beyond." DEM Solutions enjoys a symbiotic relationship with academic institutions by providing commercial-grade DEM simulation software with attractive licensing through theEDEM Academic Partner Program (EAPP). For more information about EDEM® and EDEM Academic Partner Program (EAPP), visit us atwww.dem-solutions.com or email us at oracademic@dem-solutions.com. To learn more about the benefits of EDEM Academic for Research, join us for our next EDEM Academic™: DEM Software for Simulating Granular Material Flow Behaviors webinar. Full details, times and registration instructions for upcoming webinars can be found on theDEM Solutions Events page. DEM Solutions is the market leader in simulation software and services for the design and optimization of bulk particle handling and processing equipment. The Company's ground-breaking Discrete Element Method (DEM) simulation technology and expertise provides advanced engineering and operational benefits of the Company's unique predictive modeling capability to all industries handling and processing bulk materials, enabling them to optimize equipment performance, increase productivity and operational efficiencies, and enhance product innovation. In addition to market leading EDEM® simulation software platform and EDEM BulkSim® software, the Company provides simulation and engineering support services to blue-chip companies around the world in mining & energy, equipment manufacturing and process industries. Founded in 2003, the Company is headquartered in Edinburgh (UK) with offices in Denver (USA), Yokohama (Japan) and Shenzhen (China) supporting direct sales in Europe, Americas, Japan, China, and Australia, and channel sales in the rest of the world. DEM Solutions also works with a network of industry-expert engineering service partners worldwide supporting customers in deployment of EDEM simulation technology to address engineering challenges involving bulk particles.